Physical Characteristics: 4.5 – 5.5 feet long, 35 – 41 inches tall, average 200 lbs., with tail length of 4 – 8 inches. Possess large (mule-like) ears, with white rump patch divided by short, black-tipped tail. Throat area and insides of legs are white year-round. Bucks (male) have fairly heavy, up-swept antlers equally branched into forked tines. Diet: Forbs and grasses form most of summer diet. 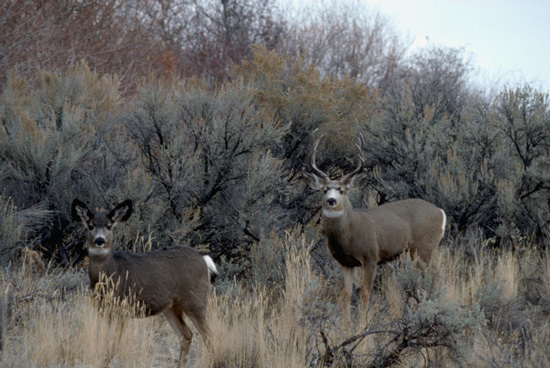 In fall, mule deer consume grasses/ twigs of shrubs. In winter, depend more on twigs and woody vegetation. Habitat: Summer habitat varies from dry brushland – alpine tundra. Bucks tend to move to tundra edge at higher elevations where they form small bands. Does and fawns remain at lower elevations. In drier regions, both sexes often found in riparian zones. Range: Widely distributed throughout western North America; southern Yukon southeast to Minnesota and south through western Texas into northern Mexico. Found throughout Clearwater Basin. Reproduction: Gestation time approximately 6.5 – 7 months; give birth to 1 – 3 fawns in May – June and weigh 7 - 8.5 lbs. Weaned at 4 – 5 months old. Sexually mature at 1.5 years. Threats: Mismanagement by state fish and game agencies can lead to intense hunting pressure. Miscellaneous: Usually silent but can snort, grunt, cough, roar and whistle.